UPDATE: We have received reports that there are no longer any markings to indicate the exact location of the beach camp. You can still walk to the general area and it will look familiar to fans of the show. We’ve visited the beach camp set where Lost is filmed twice now. The first time (June, 2007) we tried finding the short route, but were discouraged when we couldn’t find the public beach access and felt unwelcome with a ton of ‘no trespassing’ and ‘private property’ signs. In the end, we took the long way by walking along the beach from Haleiwa Beach Park. On paper, it seems like a pretty easy walk, but it took us at least 30 minutes to walk about a half a mile or so from Haleiwa Beach Park to the Lost beach camp. This short walk was actually quite tiring because with each step our feet would sink deep into the sand. Though it was a bit of a trek to get to the beach camp filming site, the miry walk was completely worth it. This beach camp has been in so many scenes of Lost that I felt like I was visiting an old friend. At some point I knew we had to tear ourselves away, but I really didn’t want to leave the camp. Just a couple of weeks ago, we revisited the Lost beach camp and we were determined to find the shorter route. I’m happy to report that we found the easiest route this time and took photos to help you find it, too. Here are the detailed directions for finding the easiest way to the Lost beach camp filming location. As you drive into Papailoa Road off Highway 83, look for the public beach access sign on your right hand side. I think it’s easy to miss, in fact we drove right past it. I took the following photo the beach access sign so that you’ll know what you need to be looking for. There’s a dirt parking area directly across the road from the beach access sign. Cars were parked perpendicular to the street. Here’s a photo. After you take the beach access path, you’ll need to turn left (Southwest) and walk on the beach for 10 minutes. Most likely you’ll either see yellow caution tape or a temporary orange fence at the beach. Here’s a photo of the approach. The orange netting was used to protect the camp area when the show was being filmed. Per reports from readers, the netting is no longer there. If you look southwest along the coast line the following scene should look very familiar. Please respect this private property. I should note that all of Hawaii’s beaches are open to the public, but the areas that have trees and shrubs are typically private property. I didn’t notice as many ‘no trespassing’ and ‘private property’ signs on this recent visit. I wonder if the local residents were required to remove some of them. You can see more of our photos from this recent visit to the Lost beach camp filming site. If you’re interesting in finding other Lost filming locations on Oahu, see my previous post on finding Lost filming sites. Have you visited the Lost beach camp? How did you get to it? What was your experience? That is so cool, just another great reason to visit Oahu. 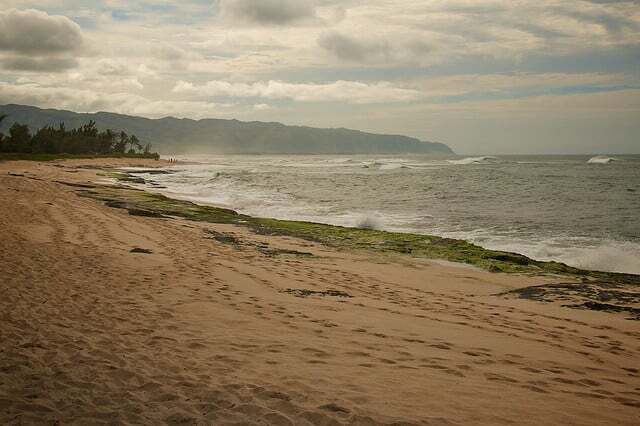 I am planning on returning to Oahu for the series finale of LOST. Do you know where the big cast party/event will be? You want to talk about being nerdy? I just added these locations (and your other LOST filming sites) to my Google “My Map” so I can pull it up when I’m there in May. Thanks! @ Andrew Miller – nice to meet another nerd. 🙂 Enjoy your trip to Oahu in May. My gosh, I have been looking for this forever.. I have been to the road and have not been able to find the walkway and I live here! Do you know if it’s all broken down now that filming is over? Also I am wondering IF you know what church they used for he seen with Mrs. Hawkins. Beautiful Church. thanks! @ Caroline – I’m glad I’m not the only one who had trouble finding the walkway. Hopefully the photos in the post will help you find it. I think it helps when you know what you’re looking for – so that’s why I took a photo of the walkway entrance. I’ll ask around to see I can find out where that church is. We were just on Oahu last week, and used your directions and found the camp without a problem. Thank you! We also saw a storage type area on Old Kam highway outside of Kaneohe that I thought might be Lost stuff too. I took a couple of pix – let me know if you want them and I can email them to you. Hi Julie – I’m glad the directions help! I wouldn’t mind taking a peek at your photos. You can send them to govisithawaii AT gmail DOT com. Thanks. Awesome! we r fan of ‘lost’. we will definitely go to see this site on our trip next month. thanks sheila. Great, Rohit. Please let us know how your visit goes. My husband and I did it the hard way, via parking at Haleiwa beach park. That walk was fun, fun, fun ~sarcasm~ The said was super mosit/soft/like quicksand coming around the coastline. We are headed back to Oahu next week and we will go back via the way you described. Thanks for the photos. We could not for the life of us find the beach access the first time. We plan on having a picnic lunch on the Lostie’s Beach. We did it the hard way too Stephanie. I got tired and started to walk on the wet rocks on the way back. Fell and busted my arm and ended up with surgery, a plate and 11 screws. Yeah don’t do that. That being said, I have a fun story. We went late December of 2007 and were there through the first week of January 2008. There was an angry security guard and his security dog there and the orange fence was still there. It is no longer there. We went to this camp on our recent visit. Initially we didn’t find the sign. Actually we turned back as we saw dead-end approaching on the road. Don’t make the mistake. This sign is almost at the dead end of the road. So, we finally found it. Thanks for your exact directions. But, i was bit disappointed. They removed lot of stuff. Only thing we could saw was orange fence and torn apart first camp (shown in first pic above). We did saw broken glasses and local wandering around there, so be careful when you park. Hi Stephanie – I hope you’ll get to see some filming this next time. Based on this week’s episode, it sounds like the Jack, Kate, Hurley, etc will be back at the beach camp soon. I can completely relate to your description of the long way. The sand on the North Shore just wants to sink you right in. Can you imagine trying to run in that stuff? You’d have to be an Olympic athlete for that. Good luck in finding the shorter route and please come back to let me know how it works out for you. Thanks so much for the information on finding access to Survivors’ Beach! We just returned from Maui, having flown over to Oahu for a day and had no trouble locating this sign. Now I have my own pictures. 🙂 The beach was beautiful and we even saw a turtle sunning itself, which made my husband happy since he’s not a LOST fan and was generously catering to my desire to see as many LOST sites as possible. The sand was difficult to walk on, but there were a lot of large, fairly smooth rocks along the shore, so that helped a lot. We took a 2 hour KOS LOST tour at Kualoa Ranch and saw many filming sites, as well as the beautiful valley where some of Jurassic Park was filmed. We also went to the Turtle Bay Resort looking for the Banyan Tree. Finally found it after a LONG walk to and through the jungle. The security guard didn’t exactly give us clear directions, so we spent more time there then planned, and we actually ironically ended up getting ‘lost’ on the way back since we didn’t go back the way we came. I was very relieved when we eventually found our way back, mostly because of the time! Still a lot to do and see. Summer camp at Camp Erdman at the YMCA was in session and one of the counselors told us which cabins were used including Sawyer’s cabin. Next time we’ll have to take the hike to the pool and falls at the Waimea Valley Audubon Center. Didn’t have enough time this visit unfortunately. We did get to the Temple and cemetery grounds and got a look at Waikane Pier from a distance. We drove by the community college, the site of Hurley’s mental hospital, but didn’t stop. It was a long exhausting day but I had a great time, though I wish we could have been there during filming. God Bless my husband for putting up with me. He didn’t complain once. 🙂 We even saw a complete rainbow on the way back to Honolulu, a perfect end to the day. Be sure to stop at Matsumoto’s for some shaved ice. It was very refreshing. Thanks for your report, Diane. Sounds like you really had a great time and your husband was a trooper for a Lostie. First of all let me thank you for providing this info for us, i started using it 2 months ago when i was planning my trip to Oahu. The last 3 days, me and my girlfriend drove all over the island looking at lost sites. We went to Camp Erdman and saw the cabins, we went to Judd trail and saw some random filming spots. Also yesterday we went to the survivors beach. after seeing the shelter there and mr. eko’s church, my girlfriend rested there while i ran ahead. I went another 30 minutes of walking/jogging and I found a ton of the props they used in the filming. A bunch of the plane wreckage was still there and there were tons of dharma barrels under some tarp. There was even a small boat there. there was lots of stuff that was recognizable from the show. I would have stayed longer but i was sort of trespassing and there was a car sitting in the middle of the road next to a man on a bike so i didnt take my chances and i got outta there. But just follow the beach after the security guard area for about 45 min to an hour and you can find those treasures as well. thanks again. Sounds like you were able to find some great Lost stuff. That’s awesome! You’re welcome, Chrissi. It’s so easy to miss that beach path, so I’m glad the photos helped! How cool that your friend saw Josh Holloway. I heard that he’s really a nice guy. Season 6 airs in February! Bill — thanks for your comment. Which of the two LOST tours did you like best? Thanks, Sebastian. I’m glad you found the beach camp. Thanks for the rock warning! Hi Sheila, I want to thank you for your very helpful information and photos will help us alot next week. I enjoyed very much reading your posting. My husband is another BIG Lost fan. We will be in Oahu next week and we will use your helpful tips to find the Lost filming sites. Leona & Gilbert – you are welcome. I hope you enjoy your trip! If you’re lucky, you might just observe some filming. We will be going in July. We are actually staying at a condo in Haleiwa. Do they still have items from the camp at this time, or is it just the beach (which is still way cool)? Thanks so much! Shann – I’m don’t know if they’ll still have the set up in July, but I do know it is still there as of today. Here’s a photo a reader snapped of it yesterday. http://tweetphoto.com/15366728 I hope you’ll get to see some of the set bits while you’re there. Enjoy! I hope so too! We are huge Lost fans and are looking forward to our trip. Thanks for the info! I doubt it will still be set up in July. We were there last June and the only thing there was the kitchen with the orange top. We just got back last week from another trip and the whole thing was set up. I got some great pictures last Monday. The beach topography changed also. The water is now OVER the rocks, which I walked on to get to the site last June. This time I had to walk on the sand and boy, did my legs hurt the next few days! That sand is not easy to walk in! The beach was beautiful, however, and I got some more great pictures! And yes, the surf was rough. The security guard told us that just a few days earlier a Japanese tourist/surfer was attacked and killed by sharks, and when they found him there were 3 tiger sharks on his body. His torn shorts were found in the water right in front of the beach camp! I feel sorry for his poor wife who was with him. How horrible! We went back to the YMCA also and the buildings were “dirtied up” and looked a lot different. We just happened upon KOS’ 10 hour tour so we tagged along (with permission). Couldn’t believe our timing! We took the 5 hour tour the next day on my birthday. Stood at the end of the pier where Kate and Sawyer sat and Sawyer threw the ring in the water. We didn’t see any filming or any of the actors, however. We missed filming at the beach camp and the YMCA by just a few days! Grrrrrr. A young couple we saw at the beach camp said they ran into Desmond walking along Lanikai Beach just the day before, though, and they got a picture with him. Lucky them! If you’re going soon, be sure to check out the waves at Sunset Beach (not marked so look at a map). They’re awesome! Wow, Diane, I hadn’t heard about the shark attack. That’s pretty unusual. I found this KPUA story on the incident http://www.kpua.net/news.php?id=19780 Very scary! We also hiked (walked about 3/4 mile) to Waimea Falls where Kate and Sawyer were in the first season. Not as big as they make it look on TV, but still nice and worth the walk. You can swim there if you’re so inclined. There’s a lifeguard and everything, including life jackets for 12 and under. We are also planning to go to Waimea Falls. I saw some pictures and noticed it looked quite a bit smaller and not as lush. I am sure they make everything more lush looking. I am so excited for our trip! Shann- funny you should say that about photos not looking as lush at the TV scene. When we visited the survivors’ beach set in 2007, they had huge sprinklers on full blast trying to keep the surrounding shrubs and such green. Thanks so much for all of your info. I hope there will still be something there when we go. I know filming will have been wrapped up so most likely not, but you never know. That is so scray about the sharks. I hadn’t even thought to be scared of sharks. We are going to be staying close by in Haleiwa and planned on doing a ton of body surfing. I am now really nervous. How sad for that poor family! We are going to be at Turtle Bay starting this weekend March 26– does anyone know whether they are still filming LOST?? Melissa – as of this week, yes, LOST is still being filmed. A reader reported that he observed some filming this week. Be sure to check out the Banyan Tree on Turtle Bay’s property that was used in the first season. It’s a long hike through the wooded area along the coast and a bit hard to find, but it’s a very pretty walk. It’s directly across the street from the fruit stand on the road, but there are No Trespassing signs there. Several LOST filming sites in there, but I couldn’t tell you exactly which ones. And don’t forget to check out the waves at Sunset Beach, not far from Turtle Bay. They’re awesome this time of year! Also Waimea Bay where you might see some surfers. The waves at the Beach Camp are pretty cool, too! You should also take the 2 or 5 hour KOS LOST tour. That takes you into the valley where lots of LOST scenes (Hurley’s golf course among many others) and other TV shows and movies are filmed. I hope I see some of the filming. If so, I’ll report back to the site! Great. I’ll keep my fingers crossed for you. I hope you enjoy Turtle Bay. It’s one of my favorite places to stay in Hawaii. If your diet allows, try the kalua pulled pork nachos at Turtle Bay restaurant Ola. They’re onolicious! Also, please let me know if they still put macaroons on your pillow for evening turn down service. Those were delish, too! Monique – I’m so glad that the directions helped you find the LOST beach. Finding it a couple of years ago was the highlight of our trip, too. Thanks for your comment. Thank you for the helpful info! I was there on March 30 and they were filming down the beach! The security had to move us ONTO the Lost set to get out of the way. I couldn’t see the actros- they were too far away but it was a scene in the water, based on what I heard over the security guards’ walkie-talkies. I got a ton of great pictures– I will put them on flicker and post the link within the next few days. Thanks again for the info and advice. It was SO cool! Melissa – That is SO cool that you were there when the filming was going on AND that you were allowed to go onto the set. I can’t want to see your photos. On another note, how did you like Turtle Bay Resort? Cool beaches, I can’t find a word to describe how beautiful they are! Here @ the survivor camp now!! Very beautiful beach. Such a great experience !! !thx for the directions!!! Relaxing on the beach w/ some turtles. i visited the survivors camp first week in april and it was mostly torn down. The security guard told us that they wrapped up filming during the week and packed up. There were still a few pieces of the airplane wreckage left (airplane door,….). The guard also told us that they have the airplane a bit further down the beach but that it was covered up. We didn’t try to find it though, since we wouldn’t have been able to see it anyways. I was able to find your route very easily on google maps street view. If you havent already tried street view its a must! I will try your route this weekend, im very excited! Thanks. Thanks for making mention of the street view. I just took a walk down Papioloa Road, but for some reason I missed the beach access point. Still, it was a nice walk. 🙂 Enjoy Oahu! Going to Oahu today. Anything still left on the beach? Saw the site today. The orange fence is still there but nothing else. Thanks for the report, Kieth. Thanks for all the great tips! We checked out the Banyan Trees at Turtle Bay today and there was still a whole lot of stuff there – some filming trucks, built up stages and a weird circular pit??? Not sure if the finale will explain any of that but hey – we took pictures just in case! 🙂 We’ll be checking out the Police Beach tomorrow…. Sarah – I’m glad these tips helped. Thanks for letting me know. Did you figure out what scene the weird circular pit was? Could it have been the well that Desmond was thrown in? Or something else? Thanks to your directions, I found it. Sorry. I meant to post the link to my short, horribly filmed video. Hi Nancy – enjoyed watching your video! I was surprised to see that there’s still bits of the orange mesh fencing that’s still up. How long ago did you shoot that video? We visited the Lost Survivors camp, Others Camp, and Crash site in April of 2012…Still amazing, but there has been some change. The survivors Camp was taken down at the appeal of home owners not wanting any more tourists trespassing. There was still one small area (maybe 5 feet) with torn down orange plastic fencing. You can still see the location is the site though…and it is a BEAUTIFUL hike!!! The Others Camp (at Camp Erdman) was fantastic. The camp was in session, but we gave a donation and the staff were so sweet. One of the managers walked us into the area with the yellow cabins and showed us where many scenes were filmed…she also pointed out Ben’s cabin, the only one the Lost Producers had changed to have a ramp for his wheel chair. The white trim had been changed back to the original brown color. She also showed us the Conference hall with the fireplace which was where the Others did their orientation and got assigned jobs. Really cool! Lastly she guided us to the original crash site happened. And you can also see the Dillinger Air Strip where Mr. Eko loaded his plane with heroin and they did the scene where the plane left him. Worth the trip. This part of the island is so amazing!!! Thanks for the update. We are heading to Hawaii next month and wondered if you think it is still worth visiting the camp talked about on this page? I relize there will be no props left to see but will we recognise the beach? Used these directions last month, can’t thank you enough. Thank you for the info! I’m planning to go this year to Oahu. Is the camp still there? Is there still something to see? I notice your post was from 2009, so I’m thinking many things probably changed since then. Paula – you must have missed the update at the very beginning of the article. Please check it out. I am the biggest LOST fan and the directions were amazing. I found the place perfectly and I spent about 5 minutes just running around freaking out. Thank you so much for making the directions so easy to follow. Chelsea – sounds like you had fun! Hi Sheila, just love the show Lost!! Your directions were perfect and awesome!! Walked to the site yesterday and it’s pretty sweet! Still some remnants of the orange fence, and also saw what appeared to be an old airplane seat cushion!? pretty cool! Hi Steve – that’s awesome that you found some remnants! Thanks for the feedback. I went to the beach site yesterday (September 2016). Your directions are right on point! I was able to take some great shots out there. Thank you for this awesome post! Hey I’m in oahu right now, we are going to look for the diner in 50 first dates then going to check out the lost set! Hopefully these directions will help. Thank you! We also went in 2007 and had no idea if there even was a public beach access. After tredging through the sand for close to an hour (round trip) I was so tired I decided it would be easier to walk on the rock. DON’T do that. Broke my arm and ended up at the Kuhuku Hospital which was a Lost filming location we hadn’t know about. After two surgeries and a bunch of metal and nerve damage, I am good. The island taught me a serious lesson that day though. Ouch! Hope your arm is all better now. Hi, just found your blog today while planning our trip next month to Hawaii. I see the post is about 3 years-old… do you have any recent news if the beach camp is still there? Thaks, aloha from Brazil! I just came back from the site and your directions were perfect. Thank you! My girlfriend and I actually walked about 20-30 minutes down the beach because it was a bit hard to tell where the specific location was. Still, it did feel familiar. I also probably could have refreshed my memory before we went but didn’t have time. Obviously there are no Lost-specific landmarks anymore but I took a ton of pictures with the intent of trying to rewatch some episodes later and trying to recognize spots. By the way – this is a great spot to watch a sunset, and we also saw 3 sea turtles straight chillin’ on the beach. Beautiful place!